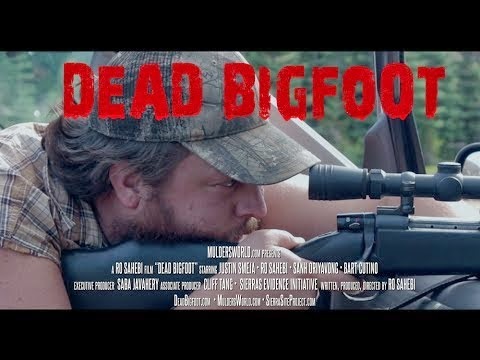 Dead Bigfoot: A True Story chronicles Justin Smeja's story about when him and a friend were out hunting bear and they stumbled upon 2 Bigfoot, of which Justin shot. Justin claims to have strangled the baby Bigfoot after he shot it and it died in his arms. Sounds a bit extreme, I know, but that is his account of the events. The incident took place in the Sierra Mountains of California. Justin did return to the kill site sometime later and was able to retrieve a small piece of the creature, but after the DNA was tested by Dr. Bryan Sykes the results came back as Black Bear. This was featured in Dr. Sykes' documentary which was released in the UK under the name of Bigfoot Files and in the US as Bigfoot: The New Evidence. So most people now see this whole thing as just another hoax but since it's free why not give it a watch.